There are many ways for local churches to have the opportunity to be the hands and feet of Jesus Christ around the globe. 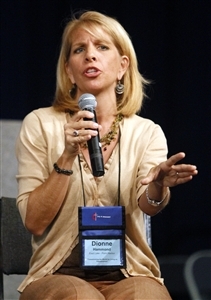 Individuals representing four distinct mission opportunities addressed members of the 2011 Florida Annual Conference on June 3 at the Tampa Convention Center. 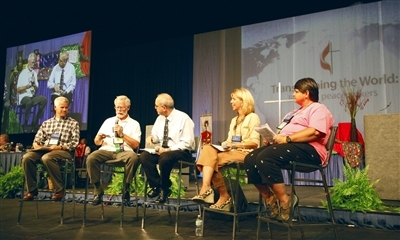 A brief video was played giving an overview of what is happening with United Methodist Volunteers in Mission (UMVIM) Florida and with the Conference’s partnerships with Methodist churches in East Angola, Cuba and Haiti. After the video presentation a representative from each ministry talked about new and exciting ways local churches can partner with the missions. 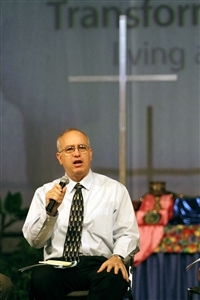 Terry Denham, chair of Methodists United in Prayer (formerly the Cuba/Florida Covenant), said that prayers are needed for the ministry, which officially began in 1997. Local churches can support the ministry by inviting MUIP mission interpreters to the local church, visiting the Methodist Church in Cuba and by establishing and maintaining a Cuban sister church relationship. There are also two special funds to support the work, MUIP Advance No. 100070 and the Cuba Methodist Seminary Advance No. 510026. Denham said the said the Cuban government has authorized 24 UMVIM trips and so far only 55 percent of the slots are filled. Ideally, Denham said, he would like to see conference teams commit to make eight of the allotted trips. MUIP is actively seeking team leaders with UMVIM training to lead those trips. In the future, MUIP hopes to establish a micro-lending program, as well send members of Cuban Methodist churches on mission trips to other countries such as a proposed trip to East Angola. "We admire their evangelistic fervor," Denham said. "They live lives full of faith, we admire that. They are spiritual. What I bring back from Cuba is best exemplified by a poster upstairs of a woman prostrate between two pews praying. We will be transformed when we learn to pray like that but I ask you to pray for us, the ministry and the people of Cuba and we will see transformation take place." The Rev. Armando Rodriguez, chair of the East Angola/Florida Partnership, talked about the progress that has been made in the country in the past eight years after a 27-year civil war left much of the country in ruins. Now that peace has been restored the country is thriving. Rodriguez, along with his wife, Icel, director of conference global missions, spent one year in Quessua, East Angola. Quessua is returning to its roots of being the spiritual center of The United Methodist Church in Angola. Four conference teams visited East Angola from January to April 2010, Rodriguez noted, while stressing that contributions from local churches made it possible to construct a new dining room for Quessua students who had been cooking outdoors when the weather cooperated. Rodriguez said the most important factor right now in East Angola is education and leadership formation. He children who once ran in the woods dodging bullets have now finished a United Methodist high school and have plans to attend the Methodist sponsored college, Africa University in Zimbabwe. Local churches can support the ministry by praying for people in East Angola; supporting missionaries in East Angola through Advance No. 100130; funding scholarships for the East Angola Boarding House, Advance No. 510024; funding scholarships for Higher Education for East Angolans, Advance No. 102010; funding scholarships for students at the School of Theology in Quessua, Advance No. 510025; funding the East Angola/Florida Partnership Conference, Advance No. 100090; and inviting speakers from the East Angola/Florida Partnership to local churches. The East Angola/Florida Partnership is entering into a relationship with Cuba. It is anticipated that conference funds will support a Cuban couple teaching at the Quessua School of Theology. While Angola is experiencing a rebirth, Haiti is focusing on rebuilding. The Rev. Dionne Hammond, chair of the Haiti/Florida Covenant, said the country continues to rebuild after the devastating earthquake in January 2010. She was a team member during a mission trip to the country two months ago where she traveled four hours by truck across rocky terrain to reach a remote village in the mountains. Hammond said although there was a language barrier she immediately understood that an excited pastor was thrilled to show team members a newly installed cistern that allows residents to have clean water. Just as a joint effort between churches allowed the village to have a cistern installed, there are ways conference churches can support the ministry. They include praying for and supporting Haitian United Methodist ministries; organizing UMVIM Florida teams to Haiti for short- and long-term construction work, medical teams and Vacation Bible Schools; responding to United Methodist Committee on Relief (UMCOR) appeals for Haiti relief support; inviting Haitian Ministry mission interpreters to local churches; and funding the Haiti/Florida Covenant Advance No. 510027. Local churches are also encouraged to send teams for short- and long-term rebuilding efforts, Hammond said. She added that Haitian pastors are in need of encouragement as well as empowerment after dealing with the aftermath of last year's earthquake. The Rev. Hollie Tapley, chair of the UMVIM Florida, said it has been very active with sending teams to Haiti, as well as other disaster sites. UMVIM Florida equips conference team members through training and hands-on mission opportunities. Children, youth and adults may participate in various mission experiences from Christian witnessing to the construction of chapels and parsonages in a global context. Tapley said there is a need for UMVIM Florida teams to be trained so that they can be deployed to areas in need. She also stressed that every conference mission team be led by a UMVIM Florida leader. Conference churches can support the ministry by organizing teams for UMVIM Florida projects and the funding of Advance No. 100180 which provides resources for training, trip planning, consultation and guidance, mission scholarships for youth and minorities, church grants and matching grants for mission experiences. After the presentation Icel Rodriguez said she is hopeful local congregations will respond to the needs presented to them.